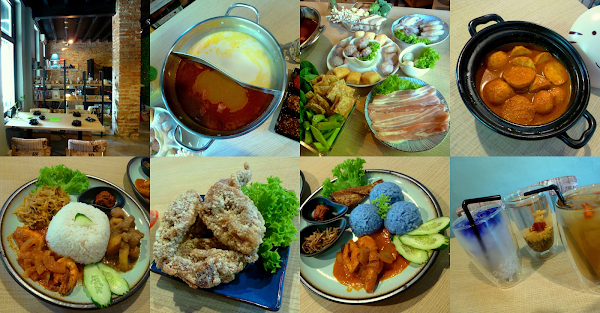 Special thanks to Repotblic Hotpot Restaurant for extending this food review invitation. Despite its relative seclusion, Jalan Chow Thye appears to draw a disproportionate number of eateries. One of the restaurants here is Repotblic Hotpot Restaurant (益锅熟火锅店), located roughly halfway between Janxden Greenlife and Isaribi Tei. As the name suggests, Repotblic caters to the steamboat-seeking crowd. The front section of the restaurant carries a brick theme, presenting a sense of coziness. As steamboat is the main attraction here, an induction cooker is subtly built into each dining table. Should customers prefer a more casual dining setting, the tatami room (和室) provides low tables with extra legroom underneath. Next to the wall covered with artificial turf is a long table with bar stools. There is also a small room for customers who require some degree of privacy. Our meal begins with an appetizer: Curry Fishballs (咖喱鱼丸, RM8.90). The curry is quite spicy thanks to fiery pungency of chili powder. I also appreciate the springy texture of fish balls. This appetizer is served in a pot whose lid resembles a cat. Another recommended appetizer is Fried Chicken (香脆炸鸡, RM8.90). Coated with bread crumbs, the light crisp is unlike anything that I have tasted before. Chicken thigh is used so that the flesh is juicier. I also find the crispy skin to be particularly scrumptious. While waiting for steamboat to be served, Fried Taiwan Sausages (炸台湾香肠, RM5.90) is a good way to keep the appetite up. Taiwan sausage differs from regular sausage in the fact that it is sweet. Taiwan sausage is also surprisingly popular among children. Moving on to steamboat, Repotblic prepares its stock from old hens (老母鸡) as opposed to pork bones. Soup choices are Corn Chicken Soup (玉米香鸡汤, RM13.90), Herbal Chicken Soup (药材鸡汤, RM14.90), Tomato Vege Soup (番茄咸菜汤, RM14.90), Kimchi Soup (滋味泡菜汤, RM16.90), Tomyam Soup (冬荫鲜味汤, RM16.90) and Milk Cheese Soup (牛奶芝士汤, RM17.90). The restaurant can also prepare the vegetarian versions upon special requests. I find Tomyam Soup to be too spicy for me. Nevertheless, the level of spiciness can be adjusted beforehand. On the other hand, Milk Cheese Soup suits my palate better. This soup is quite filling, so try not to consume too much soup at the beginning. Mixing both soups together is not a bad idea too. In fact, customers can enjoy dual flavors (鸳鸯汤底) for only RM5.90 more. Another crucial aspect of steamboat is condiments. Shown here are homemade chili sauce, fried garlic and soy sauce. As for steamboat ingredients, there are combination sets like Single Hotpot (RM17.90 for 1 person) and Value Hotpot Set (RM52.90 for 3-4 persons). The soup needs to be ordered separately. Today's meal comes from the à la carte menu: sliced pork (猪肉片, RM8.90), homemade meatballs (益锅熟肉丸, RM7.90), pork meatballs (肉丸, RM3.90), white prawns (大白虾, RM13.90), octopus (章鱼, RM9.90), shiitake mushrooms (花菇, RM4.90), abalone mushrooms (鲍鱼菇, RM4.90), enoki mushrooms (金针菇, RM3.90), lady's fingers (羊角豆, RM4.90), broccoli (西兰花, RM4.90), small cabbage (小白菜, RM4.90), mini corn (小玉米, RM3.90), stuffed cheese balls (爆芝丸, RM8.90), fried beancurd (炸腐皮, RM4.90) and quail eggs (鸟蛋, RM3.90). Besides steamboat, Repotblic also offers Blue Fragrant Nasi Lemak Rice (蓝香海鲜椰浆饭, RM14.90) for diners who prefer lighter meals. In this menu, rice is flavored with coconut milk and is dyed blue using extract of butterfly-pea flowers. Each plate of rice comes with any two of the following: Fried Chicken, Curry Chicken (咖喱鸡), Curry Prawns (红辣虾), Fried Fish (炸鱼) and Rempah Pork (咖喱肉). Anchovies and sambal (chili paste) are served in separate saucers. Rempah Pork & Curry Prawn Rice (咖喱肉与红辣虾饭, RM14.90) swaps blue-colored rice for white rice. This dish also comes with jiew hu char (鱿鱼炒), which is made from shredded cuttlefish, jicama and mushrooms. Of particular appeal is Rempah Pork, a Nyonya (Peranakan) recipe which resembles babi pongteh (豆酱焖猪). Switching gears to drinks, Apple + Pear (苹果 + 雪梨, RM8.90) is a healthy choice as it is blended from actual fruits. As an added bonus, all drinks here are sweetened with stevia instead of sugar. The glass of Chrysanthemum Tea (枸杞菊花, RM5.90) contains sweet wolfberries (枸杞). Meanwhile, Blue Barley (蓝海薏米, RM5.90) carries an alluring blue layer from butterfly-pea flower. Meanwhile, Flower Green Tea (花瓣香茶, RM7.90) starts from a bundle of dried tea leaves wrapped around a bulb of dried flowers. When steeped in hot water, the bundle unfurls and causes the flowers to "blossom". Overall, the food at Repotblic is quite authentic as the preparation process is rather involved. Equally important is the fact that food taste appeals to the mainstream palate. The restaurant also places great emphasis on food presentation. Besides the regular steamboat menu, Repotblic also serves traditional Nyonya dishes as the proprietors wish to share their home recipes (私房菜). Directions: From Burmah Road (Jalan Burma), turn right to Service Road (Jalan Servis), then right again at Irrawaddy Road (Jalan Irrawadi). At the next crossroad, turn right again to Chow Thye Road (Jalan Chow Thye). Repotblic is one of the shops on the right almost at the end of the road. Street parking is available. There is also a private car park at the back of the restaurant. Admission is free after 6:00pm.